During the summer, I didn't have much free time for sewing. 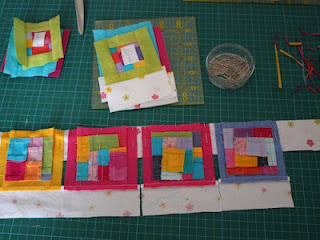 But when I could, I went on piecing my little scrap blocks. I had so many scraps, and so much fun sewing them together, that the quilt ended up much larger than I first thought. 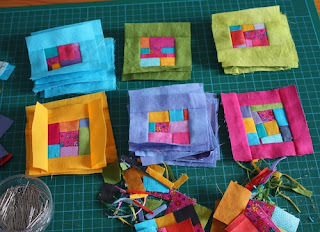 And now, I'm enjoying quilting it by hand, very slowly, in the evening. 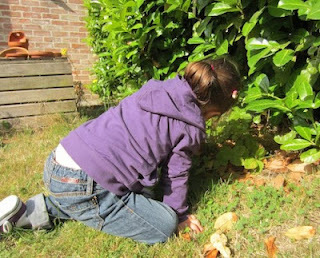 On this picture, little GD is looking for the last strawberries in the garden. I can't resist showing you two excellent drawings that she did in August. We also did some fabric painting together. In fact, we did it outside on a sunny day and she did most of the painting herself. Then we put down some jar lids on the wet paint in order to get the lighter shapes. I can see some aliens in there. Can you see them too? I do like your 'scrap' quilt Françoise, the fabric you have used with all the little blocks really sets them off. 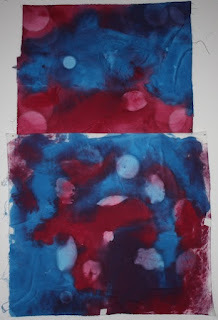 Your GD obviously takes after her Grandma and yes, there are definitely aliens! I love the scrap blocks. They look like hand dyes? 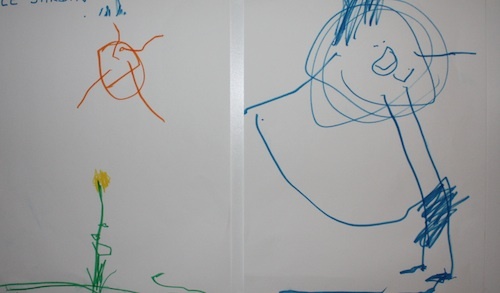 I like the drawings. It's a shame we lose the ability to do those "naive" pictures. GD has gotten so big!! I missed you over the summer. Oh my gosh she is so grown up, it's all going by to fast. Your GD has certainly grown. Your scrap block quilt looks fabulous. I really need to get going on my "maverick" quilt too. 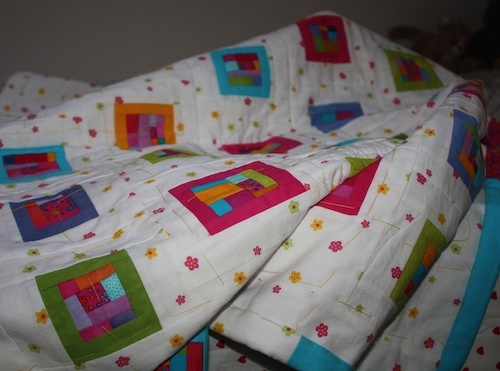 The colors are so cheerful, and the sashing fabric works beautifully! Granddaughters grow up so fast and occupy so much time. When mine is here, I spend a lot of time just watching her with a smile on my face, seeing her mother in her, and laughing. Funny how a grandchild can bring out the child in grandmothers. Is that the same GD that was a baby like yesterday??? Tell me you have more than one because otherwise it is just scary how time flies. 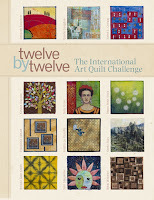 Love the quilt btw.